Prickly Dogfish (Oxynotus bruniensis) | Better Know a Fish! Why Get to Know a Fish? There are some shark species that look nothing like our stereotypical image of sharks. This is one of them. This is the prickly dogfish (Oxynotus bruniensis), and beyond saying that it is very strange-looking, there is actually not much else known about this species nor other members of the Family Oxynotidae, the roughsharks. Roughsharks and the prickly dogfish are named for their very rough skin. You can see these large skin denticles by zooming in on this photo at The Voice of Sue blog. The prickly dogfish has been collected from waters off of New Zealand and southern Australia, most often in depths 1,150 feet (350 m) to 2,130 feet (650 m). 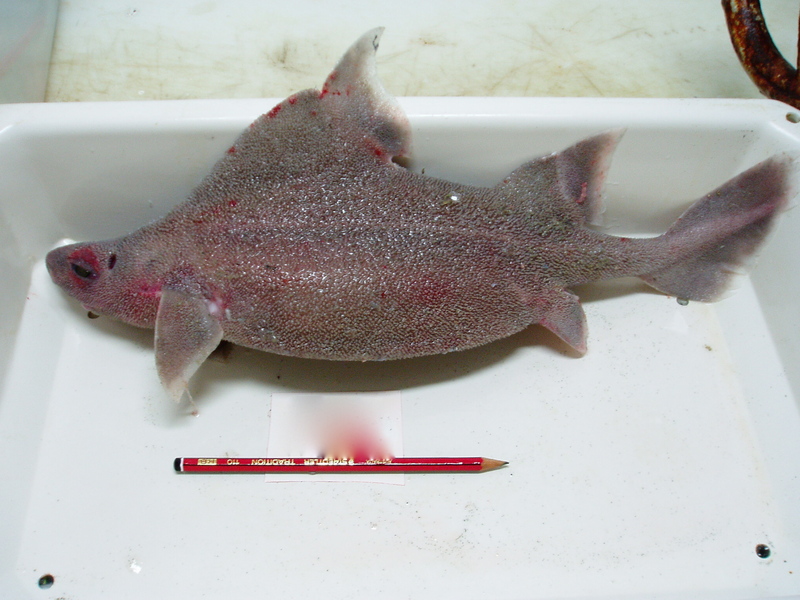 The maximum recorded length of prickly dogfish is about 2.3 feet (72 cm). So little is known about the species that the IUCN, an international conservation organization, ranks its conservation status as “data deficient” — not enough data is available to discern whether this species is dwindling or has stable populations. Discovered in 1893, yet still a mystery today. What else is out there in our oceans? What more do we still have to learn about its creatures? This entry was posted in Chondrichthyes, Marine Fish, Squaliformes and tagged Oxynotidae, Oxynotus, Oxynotus bruniensis, Pacific Ocean, prickly dogfish, roughsharks, sharks, Squaliforme. Bookmark the permalink. Why Better Know a Fish? Fish are amazing and underrated creatures. Join me as I geek out and explore the amazing diversity of fish species on our planet. Read more about our journey or look up our index of species featured so far. Ben Young Landis is a science writer and consultant by day, amateur cook by night, and fish geek 24/7. Drop a line at @younglandis or via email. Advertisements that appear on this website are selected by Wordpress.com, and are not endorsements by the author.